Salesforce has launched Desk.com for Retail, a set of CRM and e-commerce services and tools designed for small-to-mid-size retailers. Desk.com for Retail, which is generally available for $30 per month, per agent, gives retailers access to business intelligence reporting tools that can track supply chain performance. The service also provides integration tools for e-commerce platforms, such as Big Commerce and Shopify, so that retailers can take advantage of the platforms' live chat, inventory management, and customer interaction data. Additionally, retailers can take advantage of customer satisfaction scoring to help them gather feedback on customer service interactions in order to better train agents. Another neat aspect of Desk.com for Retail is Retail Flex Agent, which provides retailers with an hourly pricing model for adding customer service reps during heavy traffic times, such as the oncoming holiday season. Desk.com's Flex Agent pricing offers Desk.com seats for $1.75 for each hour each additional agent uses the tool. In June, Salesforce.com updated Desk.com to include a new agent console, reporting engine and a mobile app. Last month, Salesforce updated The ExactTarget Marketing Cloud to include a content creation tool and an integration with Buddy Media and Radian6, called Social Studio. Salesforce also updated ExactTarget's Journey Builder tool to provide personalization and real-time marketing updates for mobile apps. 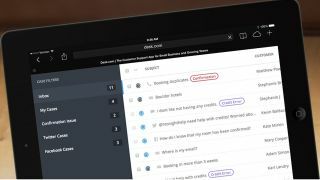 Which are the 10 CRM systems you should know?